The Rufous Hummingbird is the western species most often found in Tennessee. Deemed the “feistiest” hummingbird in North America, this hummer also has the longest migration route of the all the US hummingbirds. Typically solitary, the Rufous hummingbird can tolerate temperatures to -4 degrees Fahrenheit allowing a territory that extends north into Alaska, further than any other hummingbird. In recent years Tennessee has experienced an ever-growing winter population of this tenacious little vagrant hummingbird. Description: A small, compact hummingbird the Rufous has a slender, straight bill, shorts wings and when folded the tail tapers to a point. The adult male has green markings on his rufous back, rufous wash on the underparts, a white chest that extends into a central belly streak and his throat is a copper-red. The adult female has rufous-buffy sides and flanks, a green back, white breast and belly and her throat can be speckled with small red spots. Immature rufous hummingbirds look very much like the adult female bird except their tail feathers are rufous. Ruby-throated Hummingbird – Females are identical, and males can be distinguished by the ruby-red throat feathers and slightly forked tail. Allen’s Hummingbird – Adult male back always green and rump may be partially orange. Slightly smaller tail and longer bill. Broad-tailed Hummingbird – Both male and female can be distinguished by their broad, rounded tails and green backs, males by the white line from chin to eye-ring down to the neck and females by long broad central green tail feather as well as the rust, black and white outer tail feather. Calliope Hummingbird – Short-tailed, tiny with thin bill. Male has a streaked rosy throat. Habitat: Forested and brushy areas, along forest edges, open meadows and suburban gardens with hummingbird feeders. Diet: Dines on floral nectar, small flying insects, and sap. Readily uses hummingbird feeders. Status in Tennessee: The Rufous Hummingbird is a less uncommon migrant during winter in Tennessee. The wing-beat frequency of Rufous Hummingbirds has been recorded at 52–62 wing-beats per second. The oldest recorded Rufous hummingbird was 8 years 11 months old. 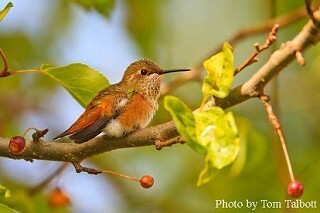 The adult male is the only hummingbird species in North America to have rufous-colored back. The feature for which he is named. Best places to see in Tennessee: Suburban neighborhoods at hummingbird feeders.